Abbeydale website hosting provides email addresses based on your website's domain name, eg. joe@mydomain.com. 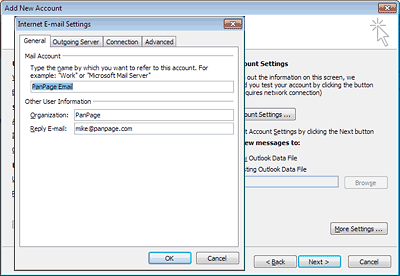 This page tells you how to configure Outlook 2010 to send and receive mail via your website. Other pieces of information are sometimes needed but they tend to be pretty standard and you don't need to change them unless your email is different. 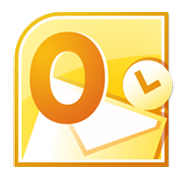 Start Microsoft Outlook 2010 on your computer. then click the '+ Add Account' button. Outlook likes to think it can do everything itself from here but usually fails so it's best to choose 'Manually configure...' at this point. Click the the 'Next' button to continue. Click the 'Next' button to continue. In the 'Your Name' box type in your name as you want it to appear to mail recipients. If you use this account for sales emails you might want this to be your company name rather than your own. 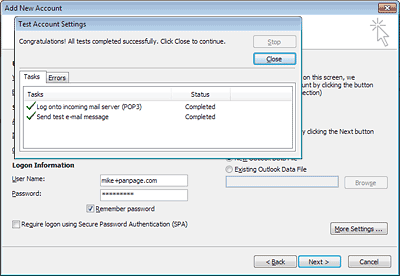 In Account Type choose 'POP3'. Don't choose IMAP!!! Really - don't! IMAP stores all your emails on the server and there just isn't enough disk space on a web server for that. 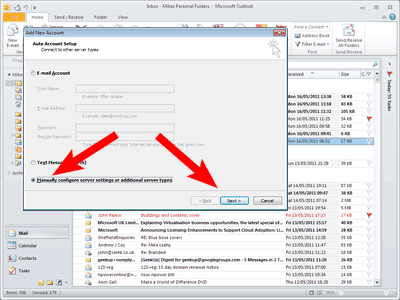 Email address, incoming (POP3) server, outgoing (SMTP) server, username and password: enter these details just as we've given them to you. Copy & paste if necessary to be sure they're right. Ensure 'Remember password' is ticked and 'Require login using secure...' is NOT ticked. Click the 'More Settings...' button at bottom right. In the 'General' tab enter a friendly name for this email account. 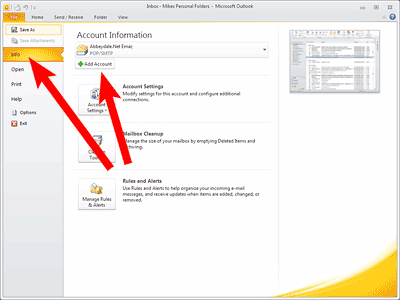 This is the name Outlook will use when referring to the account but it doesn't appear in emails. Type your company name in the 'Organisation' box (or leave blank). Type your email address into the 'Reply Email' box, unless, of course, you want replies to go to a different email address! Click the 'Outgoing Server' tab next. 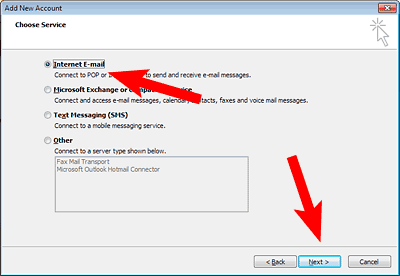 Your ISP will usually provide a mail server that doesn't require a password but you must be logged on to your own broadband account to use it. 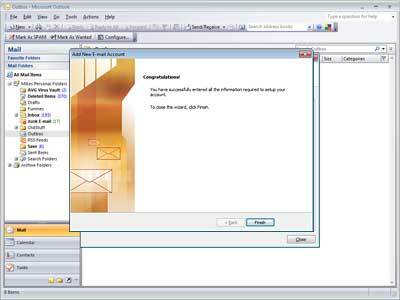 Your website email is different because it works no matter how you're connected to the internet - at home, on holiday, in Starbucks... so Outlook must give your email password when sending as well as receiving. Tick the box labelled 'My outgoing server requires authentication', and ensure that the radio button below, labelled, 'Use same settings as...' is selected. That's it, click the 'OK' button. 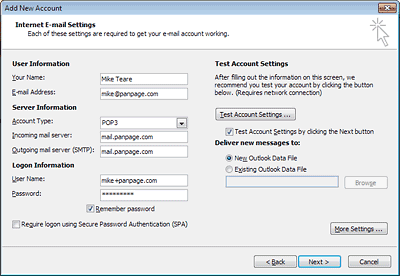 Back in the Internet Email Settings dialog, click the 'Next' button to test your new account and finish. If you get two green ticks then all is well...click the 'Close' button. If you don't see two green ticks but get a failed message then either you're not connected to the internet or you got something wrong in sep 5 or 7 above. Click the 'Close' button and then go back to steps 5 and 7 to check your entries. Once your new account has passed the test click 'Next' to finish. You're now ready to send and receive. As ever, test it by sending one to a colleague or friend, and ask them to reply to you. 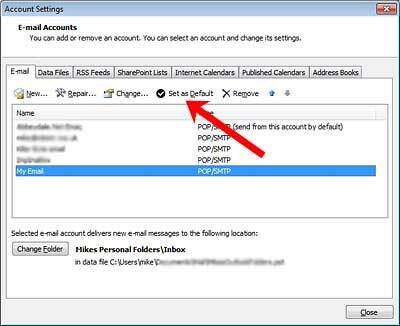 If you have more than one email account you can choose which one Outlook will use to send email by default. 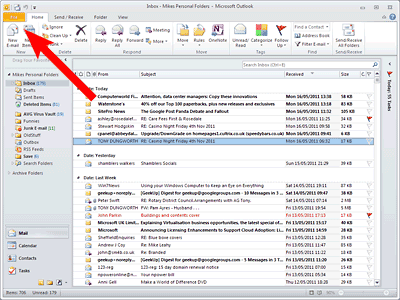 Open the Files tab again and choose 'Info', 'Account Settings' and 'Account Settings' again. Click the new account in the list, to select it, and then click 'Set as default'. Outlook will use the new account to send messages from now on unless you tell it differently. 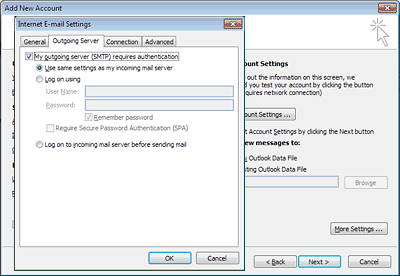 As you can see from the buttons you can use this dialog to make any changes to existing mail accounts.